Update 6.28.11: Yes! The Tribune just posted an article by Jodi S. Cohen that validates all the suspicion and skepticism: Family, friends got head start in Bright Start match Thanks for keeping at it, Jodi. Well, it looks like those of us who didn’t receive the matching funds from the Bright Start Savings Direct Save and Match program are left with two options: leave the funds in the 529 plan or accept a refund. According to all reports, Bright Start/Oppenheimer Funds will not be doing the stand-up thing and matching the contributions made before the Bright Start and Office of the Illinois State Treasurer web sites were updated to state that the promotion had ended. The Chicago Tribune wrote a follow-up article, Treasurer to refund Bright Start contributions, that again gives voice to the nagging idea that people closely connected to Bright Start or the Illinois State Treasurer’s office were among the only account owners to benefit from the promotion. A telling fact in the article is that “About 7,300 account holders, who unknowingly invested too late, are eligible for the refund.” I’m surprised the number isn’t higher, but it still indicates the degree to which the Treasurer’s office underestimated the response. Oppenheimer, as we all know by now, has been sued by the state of Oregon and eventually settled with Illinois and five other states over mismanagement of the conservative “Core Plus” bond fund when it lost 38% of its value in 2008. As of June 20, the Bright Start and Office of the Illinois State Treasurer web sites have been updated with what seems like the final word on the matter. Participants of the Bright Start June Save and Match Promotion who did not qualify for the match but made contributions prior to the time that the plan’s website was updated to reflect that the promotion had ended, may be eligible to request a reversal of their contribution. 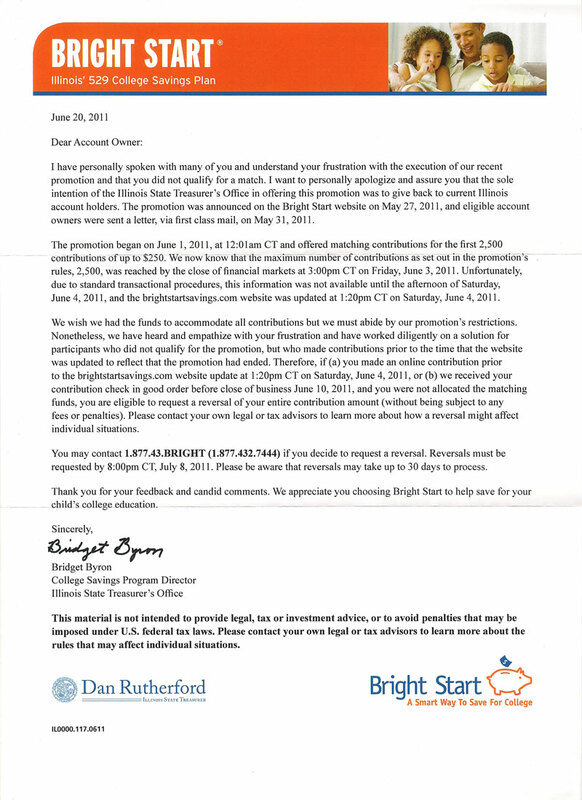 (a) You made an online contribution prior to the brightstartsavings.com website update at 1:20pm CT on Saturday, June 4, 2011, informing visitors that the match limit had been reached, and you were not allocated the matching funds. (b) We received your contribution check in good order before close of business June 10, 2011, and you were not allocated the matching funds. Please contact your own legal or tax advisors to learn more about the rules about how a reversal might affect individual situations. To request a reversal or for additional information, participants can call 1.877.43.BRIGHT (1.877.432.7444). Reversals must be requested by 8:00pm CT, July 8, 2011, and may take up to 30 days to process. This material is not intended to provide legal, tax or investment advice, or to avoid penalties that may be imposed under U.S. federal tax laws. Please contact your own legal or tax advisors to learn more about the rules that may affect individual situations. I don’t have any evidence that either the Bright Start or the Office of the Illinois State Treasurer web site was updated at 1:20pm CT on Saturday, June 4, 2011. If I recall correctly, the Treasurer’s web site was still displaying the incorrect data as of Sunday, June 5th. I’ve already decided to leave the money in the 529 plan. I’m concerned that there would be unforeseen tax implications for withdrawing it. Thankfully, I have all of my 529 funds invested in the Vanguard age-based index portfolio, so hopefully Oppenheimer gets no more of my money than is absolutely necessary. Dan Rutherford, if you’re listening, your office and Oppenheimer really borked this up. Distributing the scholarship funds back to Bright Start account owners was a great idea, but the decision to restrict the matches to 2,500 accounts was awful, and it will not soon be forgotten. Both the Bright Start and Office of the Illinois State Treasurer web sites are pretty lousy. Hiring someone with some internet savvy to identify and resolve some of their problems them would be a smart move. Update: An appropriately humble letter was sent by Bridget Byron to account owners this week. The text of the letter, along with a scan, is below. I have personally spoken with many of you and understand your frustration with the execution of our recent promotion and that you did not qualify for a match. I want to personally apologize and assure you that the sole intention of the Illinois State Treasurer’s Office in offering this promotion was to give back to current Illinois account holders. The promotion was announced on the Bright Start website on May 27, 2011, and eligible account owners were sent a letter, via first class mail, on May 31, 2011. The promotion began on June 1, 2011, at 12:01am CT and offered matching contributions for the first 2,500 contributions up to $250. We now know that the maximum number of contributions as set out in the promotion’s rules, 2,500, was reached by the close of financial markets at 3:00pm CT on Friday, June 3, 2011. Unfortunately, due to standard transactional procedures, this information was not available until the afternoon of Saturday, June 4, 2011, and the brightstartsavings.com website was updated at 1:20pm CT on Saturday, June 4, 2011. We wish we had the funds to accommodate all contributions but we must abide by our promotion’s restrictions. Nonetheless, we have heard and empathize with your frustration and have worked diligently on a solution for participants who did not qualify for the promotion, but who made contributions prior to the time that the website was updated to reflect that the promotion had ended. Therefore, if (a) you made an online contribution prior to the brightstartsavings.com website update at 1:20pm CT on Saturday, June 4, 2011, or (b) we received your contribution check in good order before close of business June 10, 2011, and you were not allocated the matching funds, you are eligible to request a reversal of your entire contribution amount (without being subject to any fees or penalties). Please contact your own legal or tax advisors to learn more about how a reversal might affect individual situations. You may contact 1.877.43.BRIGHT (1.877.432.7444) if you decide to request a reversal. Reversals must be requested by 8:00pm CT, July 8, 2011. Please be aware that reversals may take up to 30 days to process. Thank you for your feedback and candid comments. We appreciate you choosing Bright Start to help save for your child’s college education. You can listen to Rutherford’s interview on WJBC about what caused the problems. It starts with some babble about what he eats for breakfast, but then gets into some good information misinformation. Update 6.28.11: Rutherford and Byron had a number of chances to come clean about Treasurer’s office employees’ friends and family getting a head start on the matching funds, but did not. This entry was posted in Nonsense, Thriftiness on 20 June 2011 by Oliver Baty. The letter by Bridget Byron keeps referring to the failure of the update page for the number of contributions. It really fails to note that the fundamental problem was the idea to mail first class letters on the day before the start of the promotion, resulting in many of us receiving letters AFTER the promotion effectively ended. What good would a real time update do, if we don’t even know about the promotion? Just dumb.